Google Chrome is the most popular web browser users by millions of Internet users. It is also available for Android. Using it in Android also lets you sync open tabs, history and bookmarks. But Chrome for Android seems to be slow. Users also report that it takes time in loading and crashes frequently. If you also face similar problem in Chrome for Android, here is a quick tip to speedup your Chrome for Android. Use this tip to improve the scrolling experience and reduce the frame rate for better performance. Open Google Chrome in your Android device. Go to Address bar, type chrome://Flags and press enter. 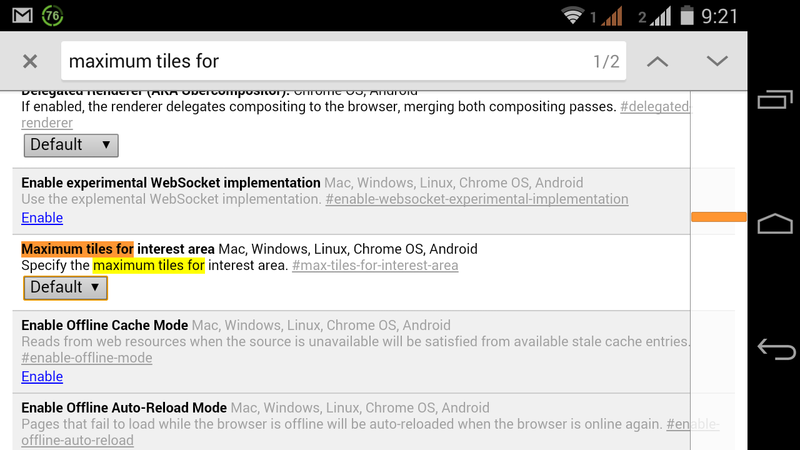 Here, search for “Maximum tiles for interest area Mac, Windows, Linux, Chrome OS, Android” option. Here change the value and select 512. If your device’s RAM is less than 512, select 256. After changing the value, scroll down at the bottom and click on Relaunch Now. After changing this, you will experience smoother scrolling while browsing the heavy web pages. It is also advised to use less tabs in Chrome because it consumes high RAM of the device. I also recommend not to change value of other flags on that page.